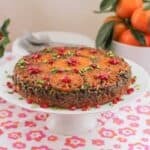 Sure you could make a plain clementine upside down cake, but why not add in some pistachios and pomegranates? They add color and flavor, like a party on a plate. Add this one to your repertoire of Sunday Supper recipes. It’s relatively simple to make but pretty enough for company. I am a huge fan of upside down cakes. First of all, they are super easy to make. The cake batter itself is a quick one bowl recipe – no creaming butter and sugar first – just pile all the ingredients in the mixing bowl and beat. And the fruit or nuts at the bottom (and then, of course, the top when it’s flipped) can be varied by what you have on hand and the season. I’ve often used canned fruit too, with great success. Drained canned apricots are particularly pretty if you take the care to place them all rounded side down. But this week our tastemakers are sharing Sunday Supper recipes using citrus, so this upside down cake features beautiful orange clementines. Mine were quite large, but if all you can find are smaller ones, that works too. Just use a few more to make sure the bottom of your pan is covered in slices before spooning in the batter. Take your dessert to a beautiful new level with clementine upside down cake with pistachios and pomegranate. Easy to make but pretty enough for company. Preheat your oven to 350°F or 180°C. Prepare your baking pan (about 10in or 25cm diameter) by buttering it liberally and then lining it with parchment paper cut to the exact size of the bottom. You can take your chances and not line it if you have a non-stick pan but sometimes caramelizing sugar will stick. And that is one of the risks of upside down cakes. Melt your butter and allow it to cool slightly. Add in the brown sugar and stir well. Pour this mixture into the baking pan. It should spread right out and cover the bottom. Peel your clementines and cut them into about four or five slices each. Remove any seeds. Arrange them side by side over the sugar/butter mixture, making sure to put all the cut sides down, because those will be up when we turn the cake over. Sprinkle the pomegranate arils and pistachios all in and around the clementines, saving some for garnish. Slowly spoon the batter over the clementines slices in your baking pan. Smooth out the top with your rubber spatula. Bake for 40-50 minutes or until golden on top and a toothpick inserted comes out clean. Remove from the oven and cool for about 10 minutes. The cake should begin pulling away from the sides of the pan. Invert your serving plate on the top of the cake pan and turn both over quickly and decisively. The cake should fall out of the pan on to the serving dish. Gently lift the cake pan off and then peel the parchment paper off of the cake. If any bits have stuck to the parchment, ease them carefully off with the tip of a knife as you peel back the parchment. Use a spatula to scrape up any syrup left in the pan and drizzle it over the cake. Leave to cool completely before cutting. With citrus and spring in mind, why not check out some of our other seasonal Sunday Supper recipes, like these 40+ Easy Spring Recipes, or our Recipes Welcoming Spring? Join the Sunday Supper recipe conversation on Twitter every Sunday! We tweet throughout the day and share recipes from all over the world. Our weekly chat starts at 7:00 pm ET. Follow the #SundaySupper hashtag and remember to include it in your tweets to join in the chat. To get more great Sunday Supper Recipes, visit our website or check out our Pinterest board. Would you like to join the Sunday Supper Movement? It’s easy. You can sign up by clicking here: Sunday Supper Movement. Sign up for our newsletter to get great Sunday Supper recipes delivered right to your inbox every Thursday! I love making makes where I don’t have to pull out my mixer. This is a beautiful and unique cake! This is one stunning, exotic upside down cake!! I’d sure love a big slice!! OMG! This is absolutely stunning and all the flavors work so well together. I have never baked with pomegranate arils but now I want to try! Love clementines but never cook or bake with them. Looks like a great dish. I love the look of upside down cakes, but I haven’t made anything but pineapple. I should change that… Looks delicious! This cake looks so moist and delicious, love that you used clementines. Not only is this gorgeous but I bet it tastes amazing! What great flavors! This is such a stunning looking cake and love the flavors! Love the addition of pistachios and pomegranate to this cake. Gorgeous, Stacy. This is such a beautiful cake! I am in love with the color and flavors! Yum! What a beautiful cake! I love the combination of flavors! All some of my favorites! Beautiful color, nutty crunch and bite of citrus, yum!